Result : Comilla Victorians won by 7 wickets. Player of the Match : Shahid Afridi (Comilla Victorians). 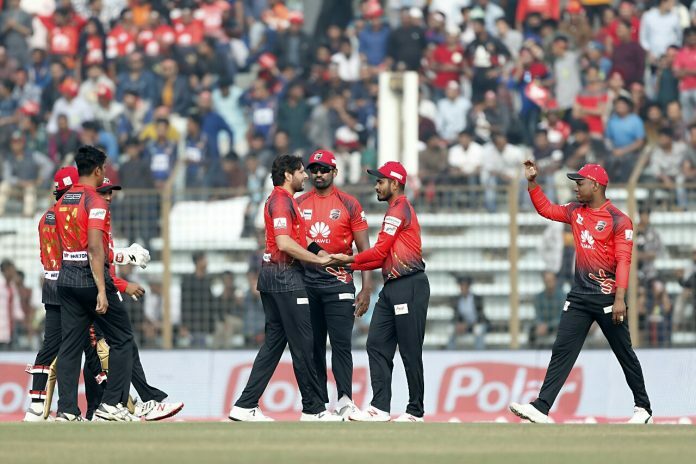 Comilla Victorians are continuing their fine form as they displayed another all-round performance to beat Chittagong Vikings by 8 wickets in the 35th match of BPL 2019. This win put the Victorians on the top of the table with 14 points from 10 matches. Despite the defeat, Vikings remained at the third spot with 12 points. Batting first, Vikings were losing wickets in regular intervals from the start of the innings and one stage they reduced to 70 for 7. Top scorer Mosaddek Hossain then played an unbeaten 25-ball 43-run knock to help his side to score past the 100 runs mark. Victorians posted 116 for 8 in 19 overs. Shahid Afridi, Wahab Riaz and Mohammad Saifuddin shared two wickets each. In reply, Victorians chased down the target easily with the cost of three wickets in 16.4 overs. Tamim Iqbal was unbeaten on 53 while second highest scorer Shamsur Rahman was dismissed after scoring 36. Nayeem Hasan grabbed two wickets for 25 for the Vikings. Shahid Afridi named the player of the match for his spell of 2 for 10.